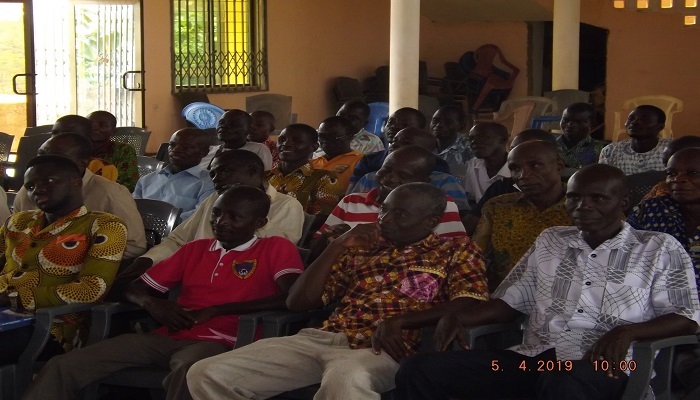 Elders and Church Leaders in Twifo Zone of the Assin Foso Area of The Church of Pentecost have undergone a 2-day leadership training. The conference which was the first of its kind, was held under the chairmanship of the Assin Foso Area Head, Apostle Sylvester Arhin. It took place at Asikafo Assembly in Twifo Praso, from April 5 to 6, 2019. It was aimed at educating the participants on the Church’s Vision 2023 document to enable them explain it to the members. Explaining the vision document to the leaders, Apostle Sylvester Arhin said that God has built His Church for a purpose, thus the Church is to worship Him and also tell the whole world about His saving power. “The Church has divine origin, divine existence, divine function, divine provision and protection. As a result of that, everything about the Church must always glorify God,” he said. Apostle Arhin appealed to the leaders to embrace any change that will make the Church user-friendly, and desist from acts that can cause the Church to lose its purity and focus. In a sermon, the Area Evangelism Ministry Leader, Pastor Michael Antwi Boasiako, who doubles as the Assin Adiembra District Minister, called on Church leaders not to turn their back to God when He needs them to work for Him. Speaking on the topic, “In Your Quest In Possessing The Nation, Don’t Disappoint God,” based on Psalm 78:9-10; 72, he stated that, Christians are to serve the Lord with all their hearts and hands. The heart, he said, should show their integrity whilst their hands should show their commitment. He therefore urged believers to work hard with their skills and talents to help expand the Kingdom of God. “Do not be like the Ephraimites who disappointed God although they were endowed with God’s power to fight for Him,” he said. The pastorate and the church leaders expressed their profound gratitude to the Area Head for organizing the conference which, they said, has helped to enlighten them on the vision of the Church. They promised to do whatever they could to help the Church possess the nations.